A little something I put together about Seoul! My first foray into cooking with my oven. My new oven. G-market was difficult to navigate but I paid for it eventually! They're not very pretty but they tasted good. ...and as many toppings as we could fit on. There's something romantic about travelling on the train. Beautiful countryside whizzing past. Alone with your thoughts. Smooth and traffic free. Sometimes there is a delay, but you never find yourself staring out at concrete and cars. But trains are magical and take you somewhere exciting, to experience new adventures. 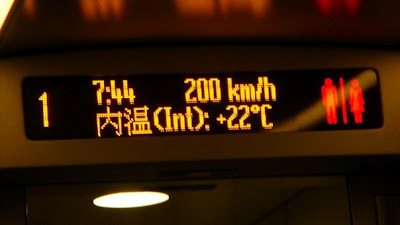 Fast train from Shanghai to Suzhou. Same speeds as KTX. The KTX in Korea is incredibly fast. 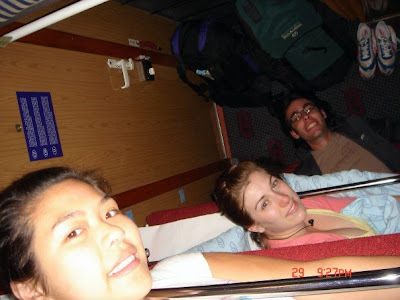 It's basically the same as the fast train we used to get from Shanghai to Suzhou on a sunday morning at 6am after a night out, to save on hostel fees. I have taken the KTX quite a few times on my visits to Busan. I think it is brilliant! The seats are excellent. There is good leg room and when you want to recline, you don't have to worry about the person behind you, because the way it's designed doesn't affect them. The bottom of the seat slides forward giving you slightly less leg room, but not making anything different to the person behind. I always get person-behind-guilt if I push my chair back normally. When all the seats are taken you are offered a 'free seat' ticket. On my way to Busan this weekend it meant, first come first served on 2 end carriages, but on the way back this meant you don't have a seat. When the train pulled away from Busan Station, I grabbed a free seat, but I knew this might only be free until the next station. Another woman had done the same, and every time we got to a station she stood up and waited to see if someone sat in the seat she had taken. No one did. I decided not to move, and sat with nervous anticipation every time we stopped. And I'd either chosen someone's seat who'd missed the train, or they saw a foreigner sitting in the seat and didn't want to have to try and get me to move. Either way I got a seat for the whole journey back! I have been listening to this all day, and it's so relaxing!